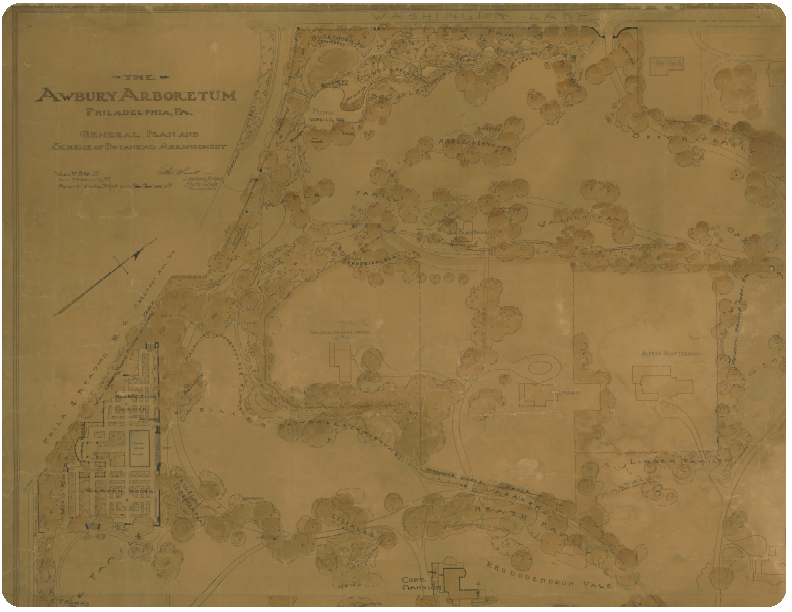 A Garden For the Trees………… Part IV: Awbury Arboretum « John Bartram Lives! “A box…20 inches or two feet square and 15 or 16 inches high & a foot in earth to be enough.” Peter Collinson to J.B. 1735/36. From which dimensions can be deduced the average size of the space underneath the ship’s Captain’s pillow. 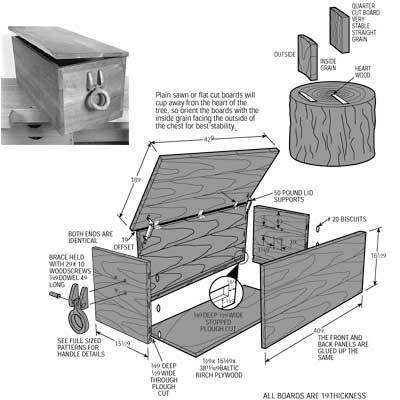 Construction of a sea chest sturdy enough to withstand the weather of the North Atlantic crossing. Without knowing how much it would impact my life, I began a correspondence with Peter Collinson. He was a cloth merchant, a draper, who was also passionate about botanical science. He became much more than my English friend. 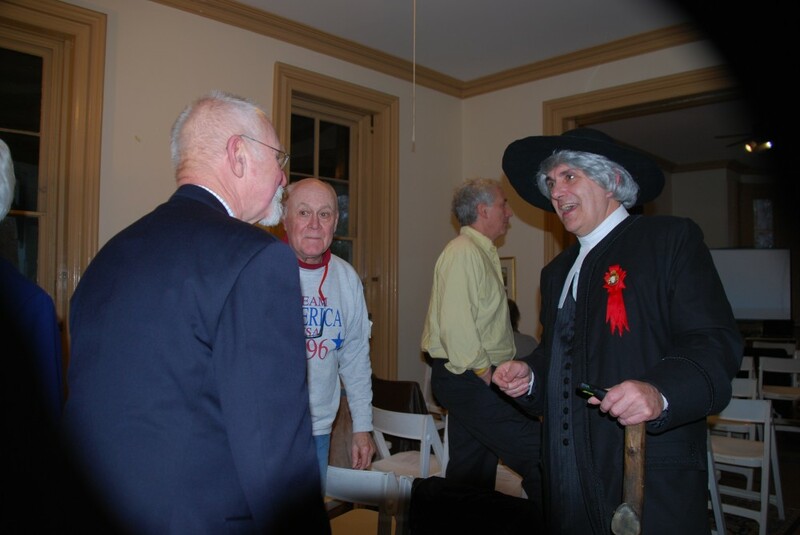 He was at times mentor, contractor, intermediary, treasurer, benefactor, and Quaker. Once begun, the correspondence led to a trade in actual botanical specimens and later to business in nursery production. The first of its kind in North America. The English could not get enough of the material that was free for the taking on my travels north, south, east and west. Wherever I went, there was an abundance of material to be collected, catalogued, transported, and grown. The shipments became regularized into “Bartram’s Boxes.” A Five Guinea Box was delivered to the subscriber with a guarantee that it contained 100 different species of plants: roots, cuttings, switches, corms, bulbs, slips, or seeds. With as many as 1000 total bits of plant material to the carton. At the greatest, we shipped 32 boxes. That’s 32,000 plants. And the success of the venture was, by and large, dependent on the grace and good favor of the captain of the vessel that carried the crates. It was a rough trade with a lot of vagary about it. It could take months or in some cases years for the assignee to receive the shipment. Sometimes–actually in more cases than I care to consider–the shipments didn’t arrive at all. War. Storms. Theft. Destruction by vermin, cats, crew, or passengers. Ruination by salt water. Baked in torrid calms or frozen in icy winters. Captured by French Men-of-War in an unending series of conflicts and clashes. The elements that conspired against the success of our venture were many and maniacal in their insidiousness. But we persevered and ultimately triumphed. A ship’s Captain was always welcome at our table and in a spare bed. Kindness to him was always repaid with a better berth for the plants we were trusting to his traffic over the seas. My wife was constantly encouraged to give them hospitality in my absence. They were the partners in our endeavor who could most quickly ruin the merchandise. The Cope’s were another Quaker family in Philadelphia. Their trade was in trade. They owned and operated one of the most successful shipping enterprises out of the docks. Their packets were some of the fastest and sleekest to be found in the world of their time. And with the thriving of their business our trade was enriched. Bartram’s plants were responsible for reforesting the entirety of Southern England. It had been denuded after the great harvest of trees that built the wooden wall to defend the Island against the Spanish Armada. My shipments went directly into the ground of some of the finest country homes and aristocratic landscapes of the English supremacy. And money flowed both ways across the Atlantic. Fortunes were made in the trade that included the horrors of slavery as two legs of the shipping triangle. With their success in shipping, the Cope’s purchased acreage west of the city. 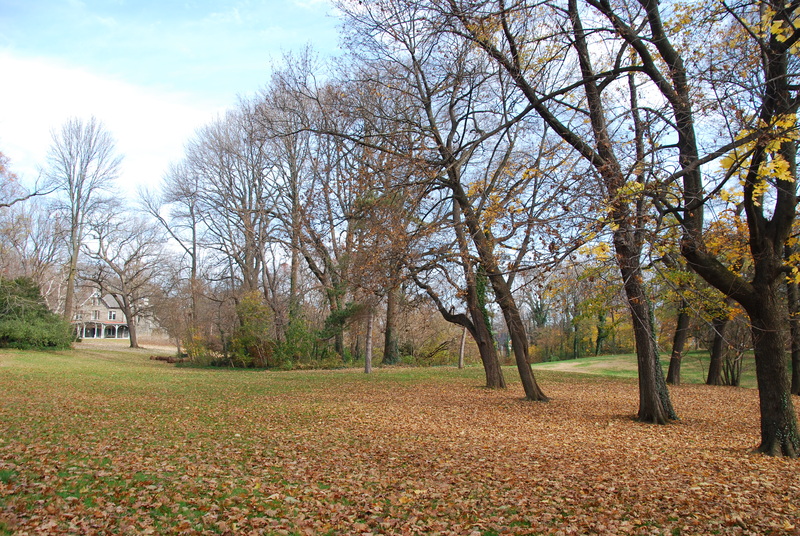 Germantown in the early days was a very rural and pastoral setting. The Cope property became their haven and summer refuge against the formal heat of the city house. First, one summer-house was constructed on a knoll at the high point of the land. Then, it was joined by the construction of additional houses for dependent generations of the original family. Sons, daughters, grandchildren, spouses, in-laws and cousins. It became a family compound. And then it was gathered up and preserved with an endowed trust for nature. It was the style then in vogue. That vogue was established by the export/import of my trees and shrubs to a list of subscribers setting new standards for landscaping the South of England. John Bartram traveled throughout North America to discover and identify North American native flora. I exported it to England where the novelty of the plants becomes the rage of an age. This new 18th Century trade in luxury goods from our wildlands is used to decorate the landscapes of the English countryside. The new style is identified with the English Aristocracy and is exported back to the colonies to be copied as if our “betters” were allowing us the use of an exotic gift. 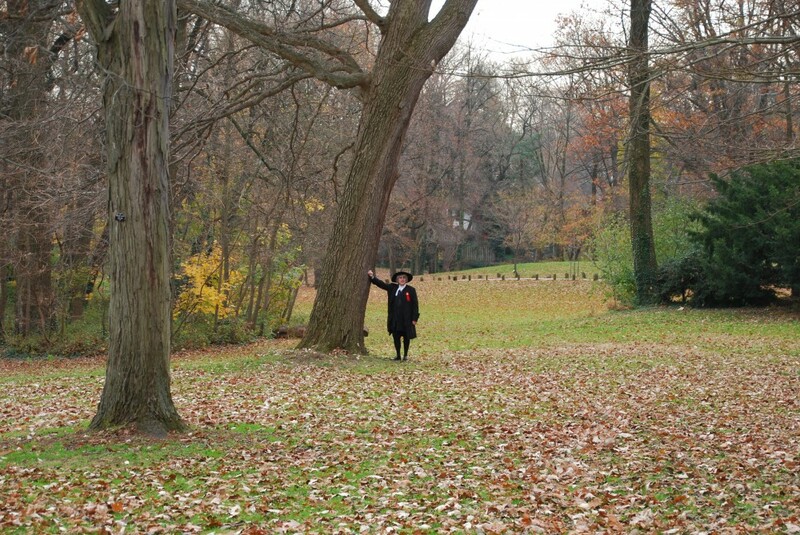 John Bartram stands at a focal point in an English-style landscape at Awbury Arboretum. It is the closest that he's gotten to the actual thing. In other words, MY plants came back to us identified only as select parts of an “English Country Landscape.” Somewhere, God is laughing. At the time, my family just continued to sell the same trees. They just didn’t have to ship them as far.